eggs in incubators on February 1 were up 6 percent from a year earlier. 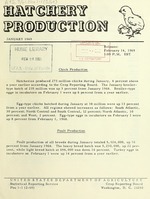 up 8 percent from February 1, 1968.
incubators on February 1 were up 14 percent from a year earlier. S- Th-usan --- Percent --- Thousands r.. P.t. Jersey Buff, and wild turkeys. New Hampshire and Vermont combined to avoid disclosing individual operations. Massachusetts and Rhode Island combined to avoid disclosing individual operations. Footnotes continued on following page. il South Central total includes Kentucky and Oklahoma to avoid disclosing individual operations. : Thou. Thou. Thou. Thou. Thou. Thou.